A University of Strathclyde staff member became one of the lucky 8,000 people chosen to carry the Olympic Torch this summer. David MacPherson, who became a diligent cancer fundraiser after he was diagnosed with the disease, joined the Olympic torch relay in the run-up to the London 2012 games. 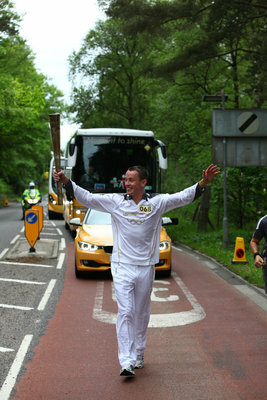 During its seven day trip around Scotland, David, a Sports Centre Assistant at the University’s Centre for Sport and Recreation, carried the torch in Banchory, Aberdeenshire, on June 11th, which formed part of its eight week journey towards the opening ceremony at the Olympic stadium in London. Colleagues at the Centre for Sport and Recreation nominated David in recognition of his fundraising runs for the Friends of the Beatson charity and his dedication and commitment to his parallel career as a shinty player with Inveraray. David’s story was highlighted in Caman/Shinty, a TV documentary series broadcast on BBC Alba last year, which followed his initial diagnosis with testicular cancer and his return to working and playing following treatment. “It’s been an unforgettable day and I’m proud to have been among the people who have had the chance to carry the Olympic torch.” David commented. The 32 year old was chosen from a total of 90,000 applicants and ran 300 yards with the torch in front of an excited crowd which included friends and family. “I’m grateful to my colleagues for nominating me to take part. We encourage staff and students at Strathclyde to take up sport and physical exercise, for their health and well-being and to enhance their experience of the University.” He added. “Shinty and running have had great benefits for me and it’s been an honour to have had this recognised in my torch relay run.” Said David.